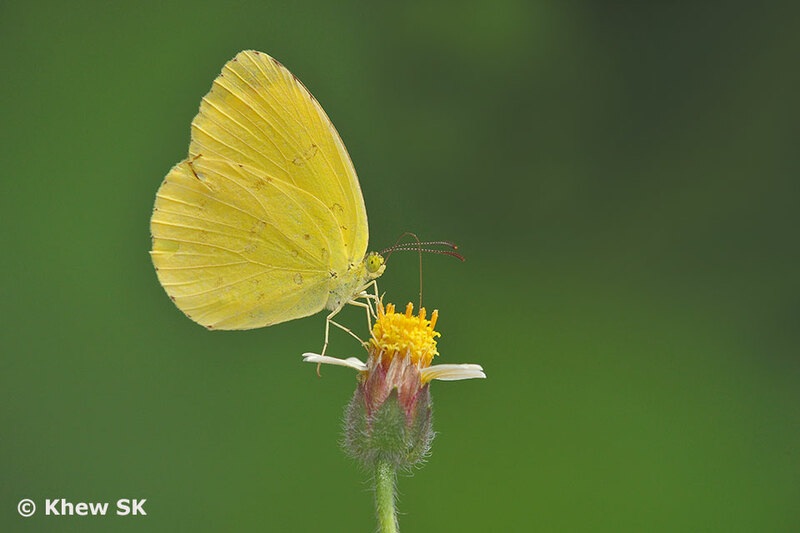 In this article on Singapore butterflies' favourite nectaring plants, we take a look at another common 'wildflower' that is considered an unwelcomed weed by landscape and greenery maintenance personnel. 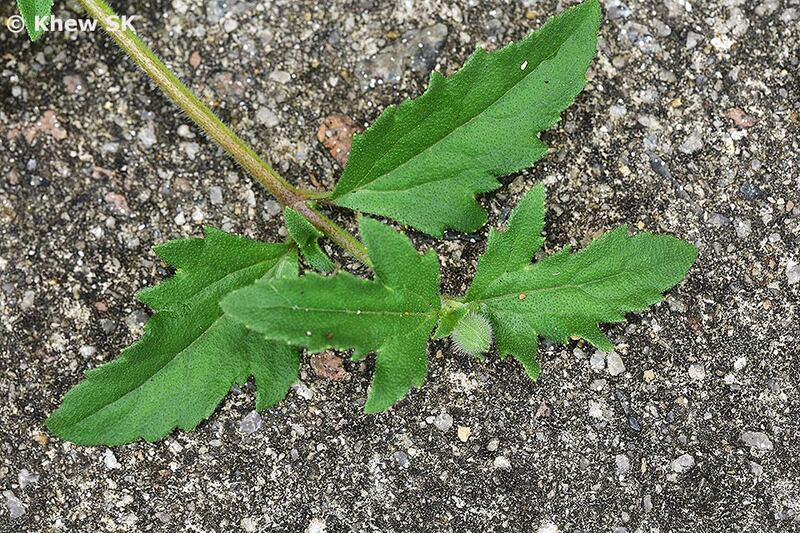 This weed can be found mainly in urban areas in any patch of roadside greenery. 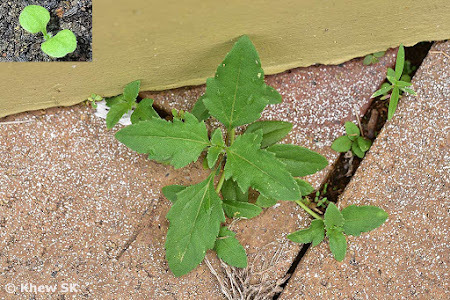 Where the seeds of this plant is able to find some soil, it sprouts from cracks in concrete footpaths, gaps in modular interlocking clay and concrete pavers, car park lots and crevices in walls and rocks. This perennial weed, often referred to as Coat Buttons (Tridax procumbens) is the bane of any human-managed landscaped settings like parks, gardens, lawns, grassy roadside verges and planting beds. 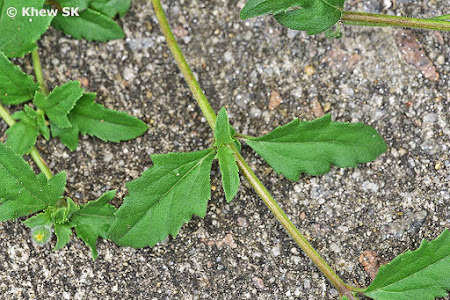 Such weeds like the Coat Buttons become "unsightly when they distract the uniformity and tidiness of the landscape. 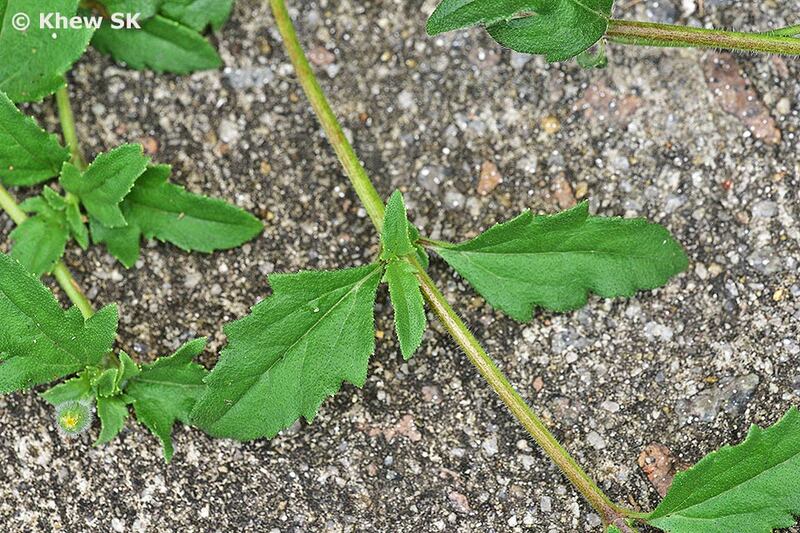 The unmanaged weed infestation will result in extra costs of maintenance." 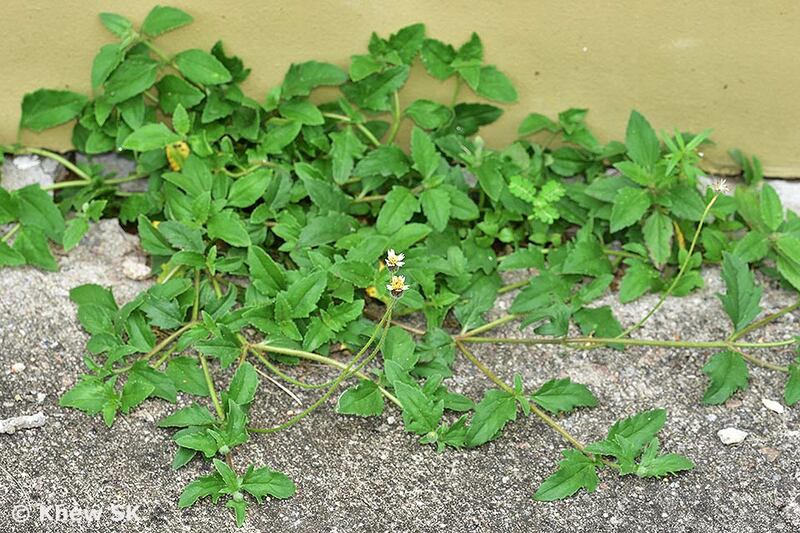 Ref : "A Guide to Landscape Weed Management by Chin Siew Wai - 2015 : Centre for Urban Greenery and Ecology (CUGE)"
“What is a weed? 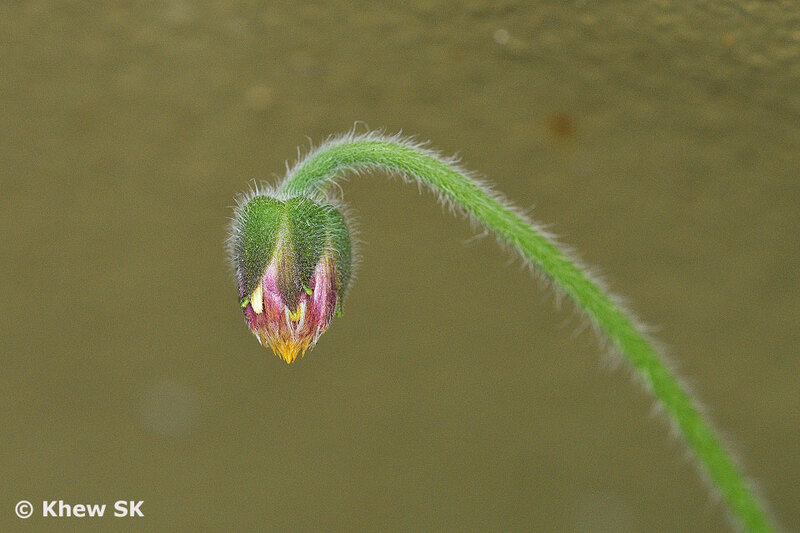 A plant whose virtues have not yet been discovered.” - Ralph Waldo Emerson. And just doing a word search on any search engine and you will come across many quotes about weeds and how humans differentiate between a plant and a weed! 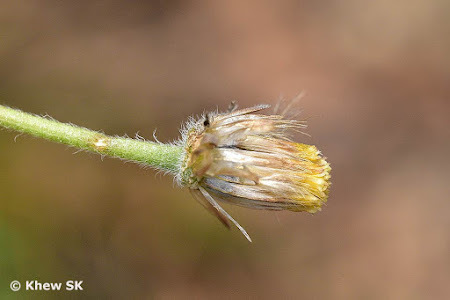 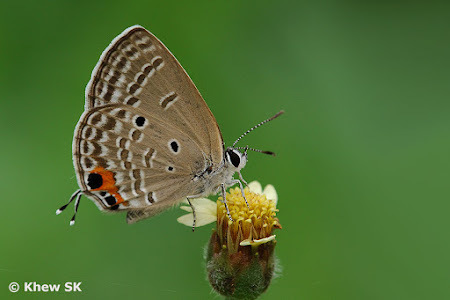 However, in nature, a plant like the Coat Buttons is a part of the food web that is important to small insects, and in particular, butterflies. The flowers of the Coat Buttons are an essential source of nectar to adult butterflies flying around in search of their daily liquid sustenance. 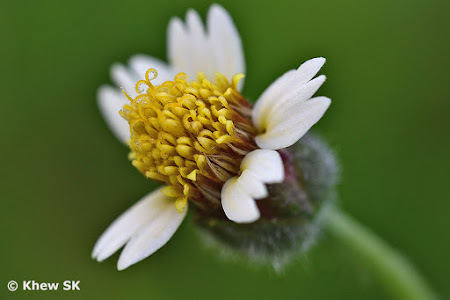 Taking a short walk around the housing estate in which I live, it was quite easy to find the Coat Buttons plants. 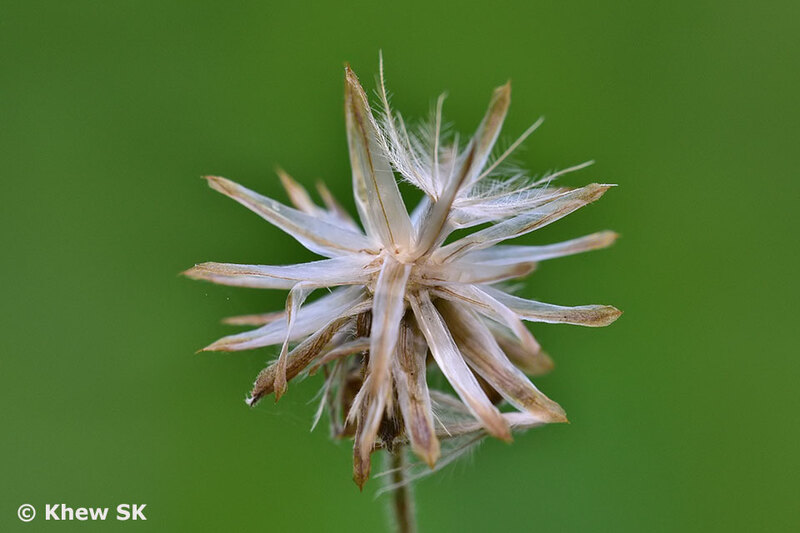 They can be found along footpaths, undeveloped sites that are planted with Cow Grass, at carpark lots, potted plants, grassy roadside verges, children's playgrounds and almost anywhere that the seeds of this plant can take root and grow. 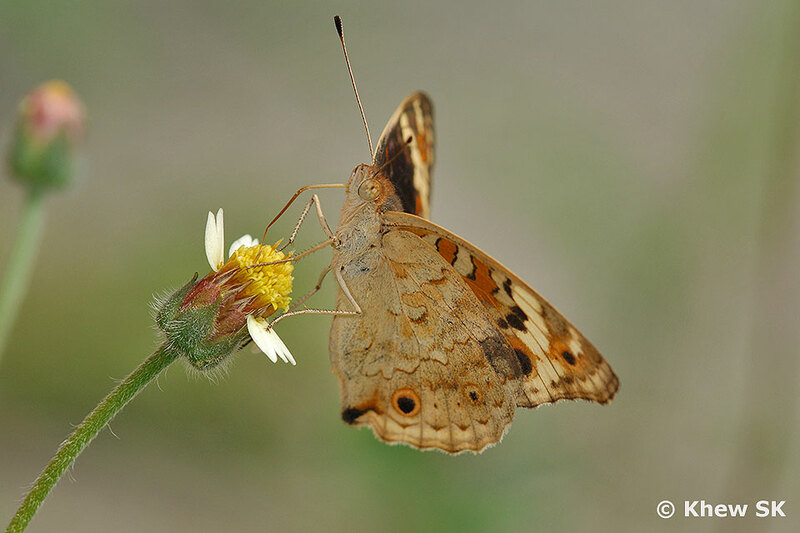 In areas where they grow profusely (before the municipal maintenance contractors wipe them out temporarily), one may also notice a number of butterflies feeding on the Coat Button flowers. 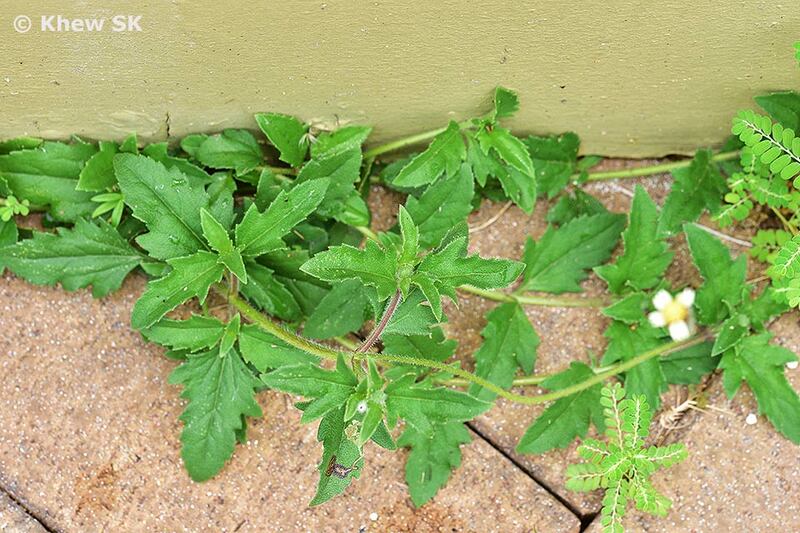 But as soon as they are removed, they reappear in a matter of weeks - testimony of the tenacity of this unwanted plant! 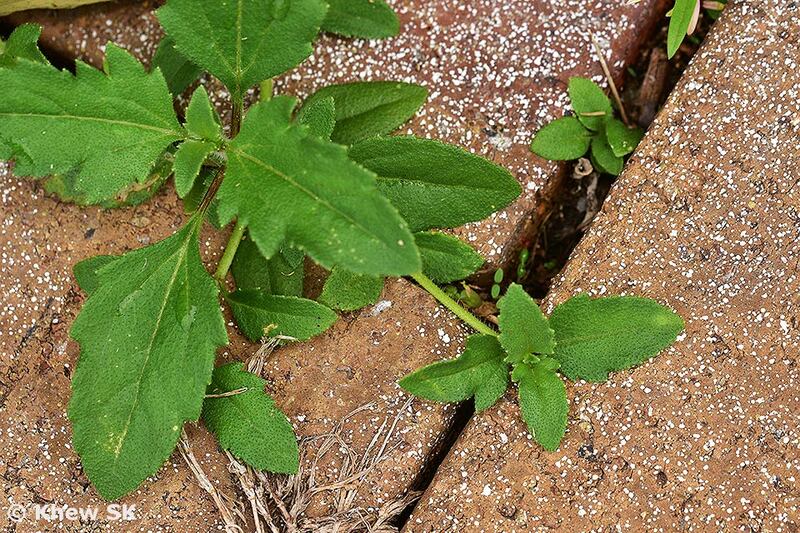 The plant is particularly well-adapted to coarse-textured soils and can stand periods of drought. Amongst its ethnobotanical uses, the Coat Buttons plant has been used for wound healing and as an anticoagulant, antifungal, and insect repellent. The juice extracted from the leaves is directly applied on wounds. 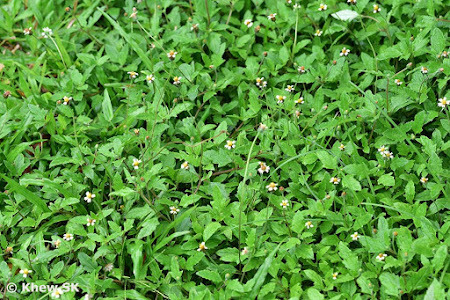 It is used in Ayurvedic medicine for liver disorders, hepatoprotection, gastritis, and heartburn. Extracts from various parts of the plant are also used as treatment for bronchial catarrh, dysentery, diarrhoea, boils, blisters, and minor cuts. 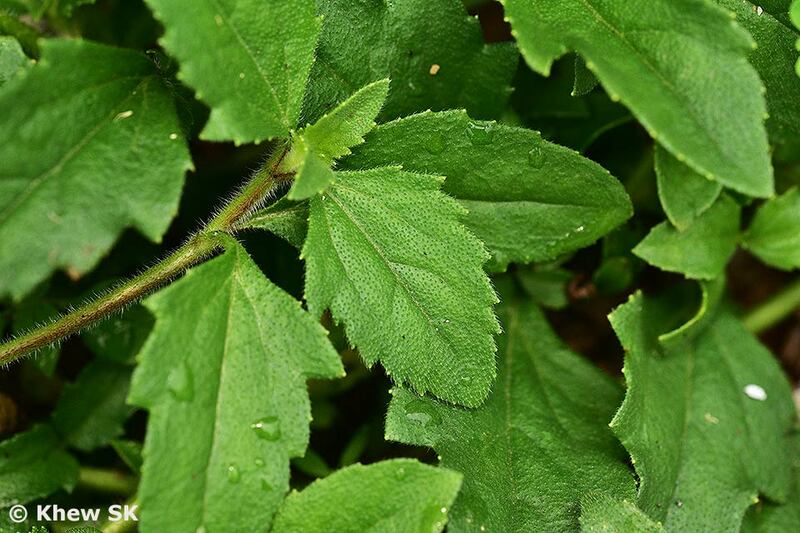 The extracts from the leaves, when mixed with other herbs, is even touted to convert grey hair to black naturally! 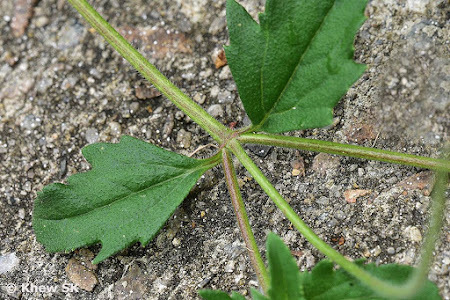 This humble weed (or wildflower, as I prefer to call it) is obviously not an intentionally cultivated nectaring plant for butterflies, unlike many of the nectaring plants that have been previously featured in this series. 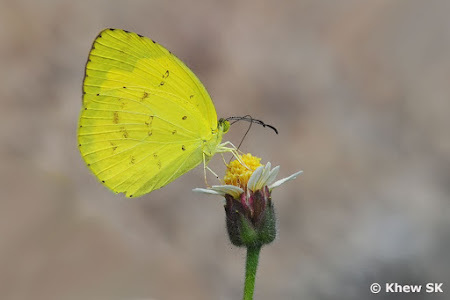 Due to their persistent propensity to reappear even after they are removed, the Coat Buttons is not difficult to find and where they grow, one may also expect to find the random butterfly stopping and feeding on their flowers. 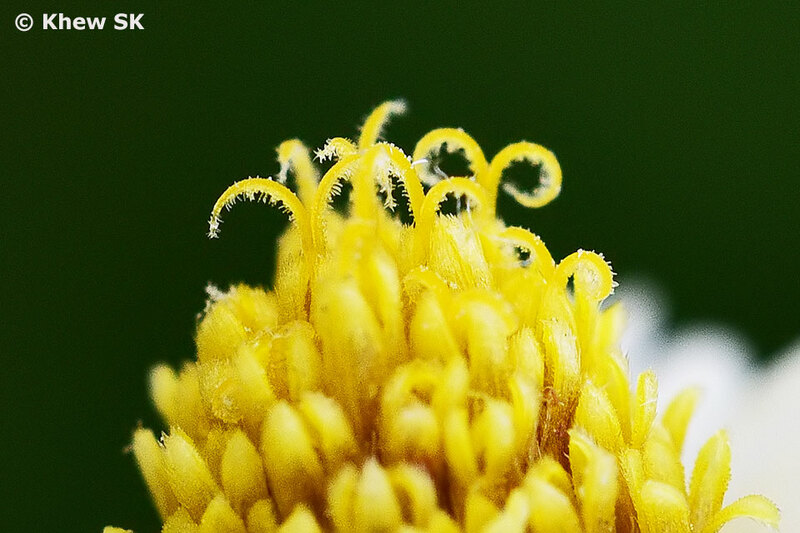 The Coat Buttons plant's taxonomic name Tridax is derived from the Greek τριδακτυλος (tridaktylos), three-fingered or -toed, referring to the three-toothed ray florets. 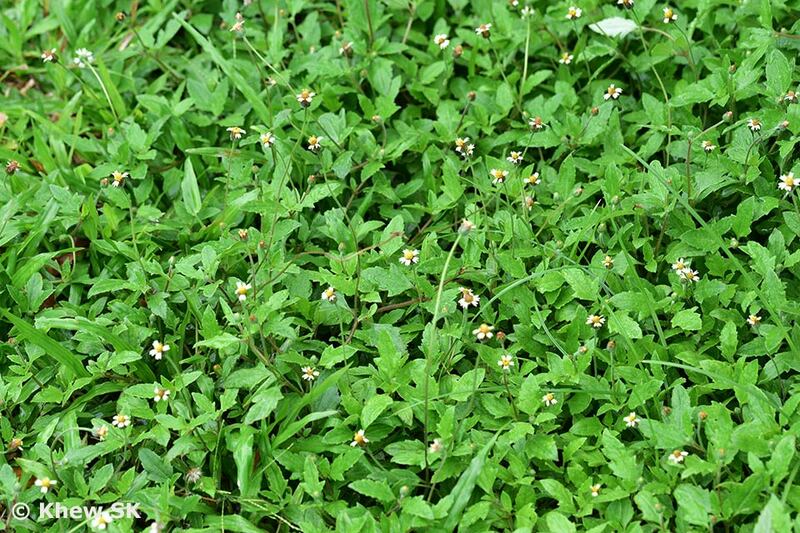 Procumbens is Latin for ‘falling forwards, lying down, which probably describes how the plant grows in its natural state - with horizontal creeping stems. 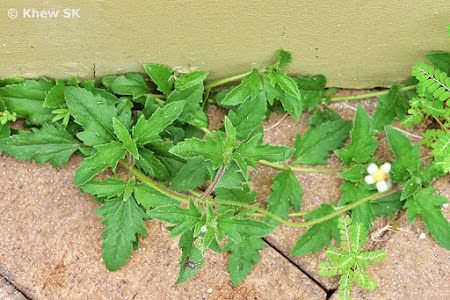 The plant is native Tropical Latin America and Mexico, but has spread globally where it is often classified as a 'noxious weed' in the USA and Australia. 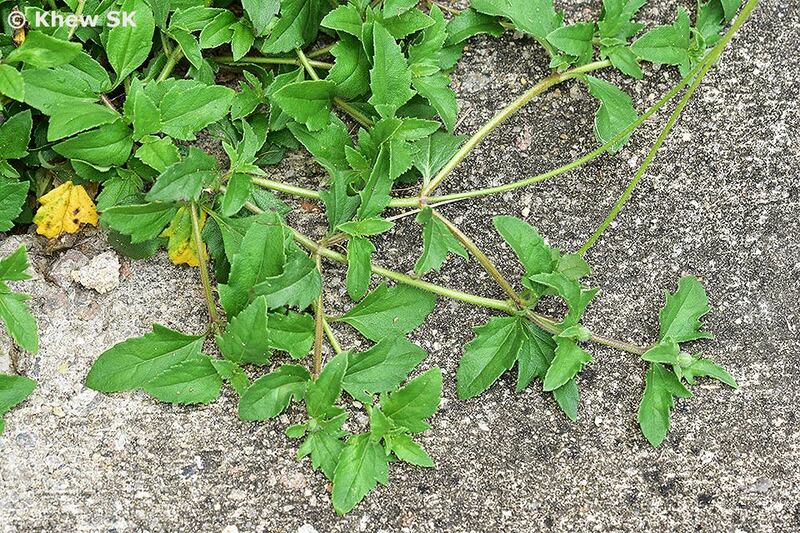 The plant is a semi-prostrate perennial herb with a slender tap root. 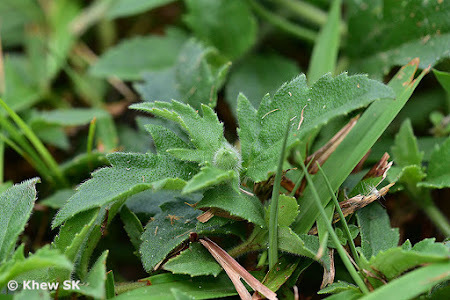 The leaves are simple, opposite, toothed and generally sagittate, hairy on both surfaces, bright green above and grey-green below. 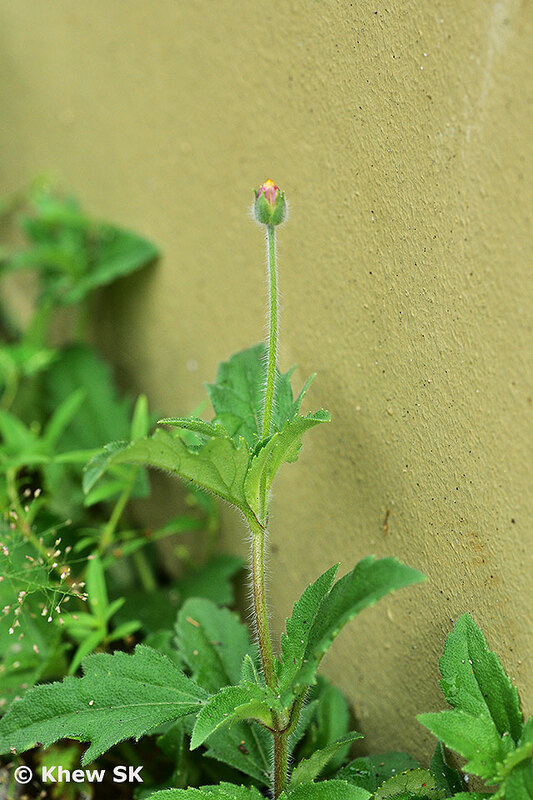 The young shoots that grow from seeds have leaves that are small and almost circular. 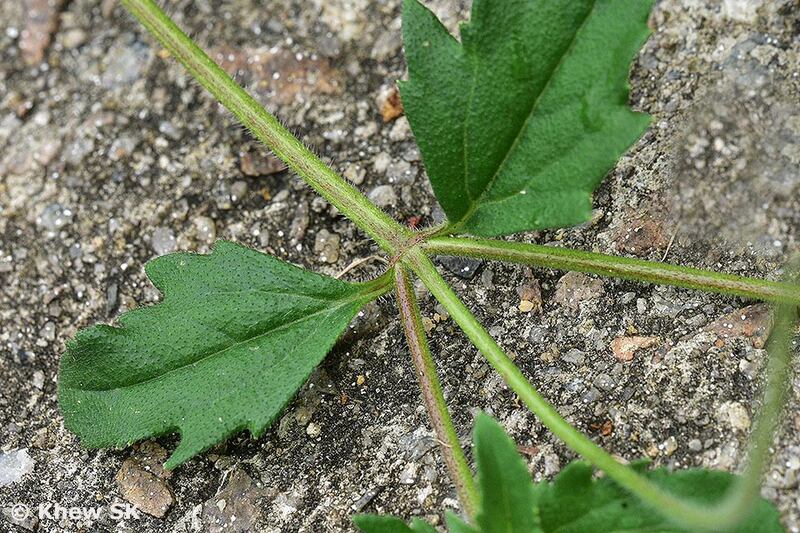 As the plant matures, the leaves become deeply indented and arrow-shaped. 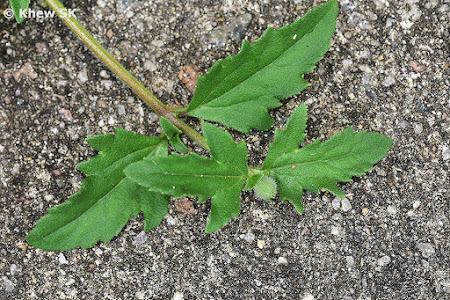 The rather thick leaves are pimpled and rough to the touch with fine white hairs. 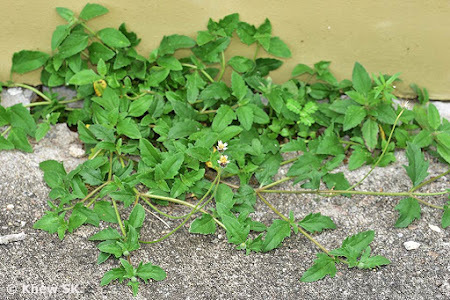 The leaves grow rapidly and can spread across a large area if it is not managed, often depriving other plants of nutrients and stifling their growth. 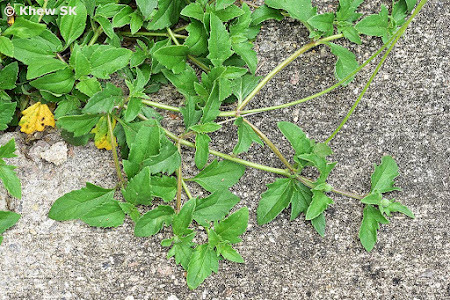 The hirsute creeping stems can reach from to 8-30 inches (20-75 cm) long, generally growing in a procumbent manner, extending horizontally outwards from the main plant. 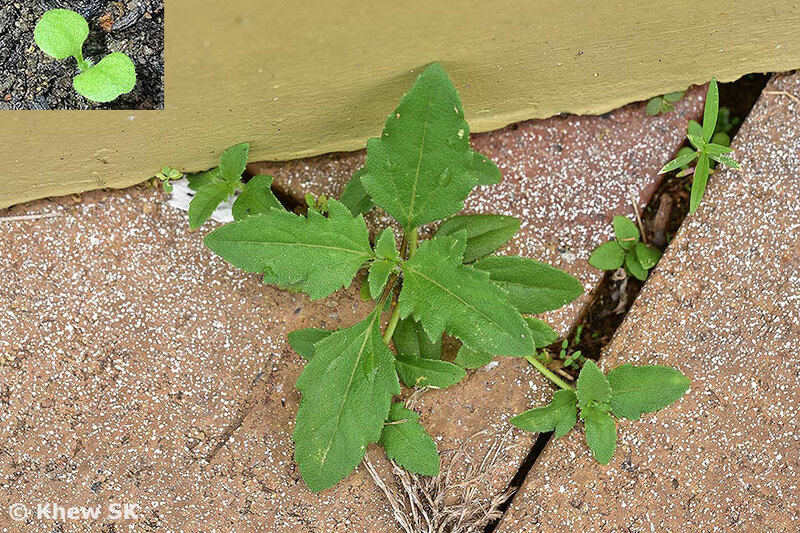 New plants can root at the nodes and spread quickly. The stems which bear the flower heads are more or less ascending, up to 50 cm high, round in cross-section, striate, and sparsely to very hairy. The flowers of the Coat Buttons are yellow, in solitary heads that are about 2 cm wide, each on a 10-30 cm long stalk. 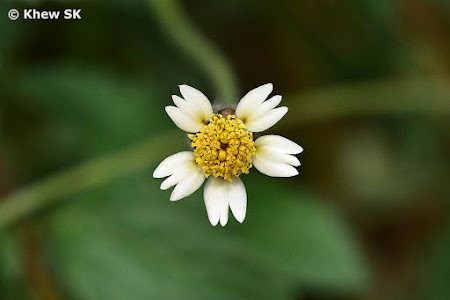 The plant bears daisy-like yellow-centered white or yellow flowers with 4 to 6 three-toothed ray florets, notched on the outer edges. 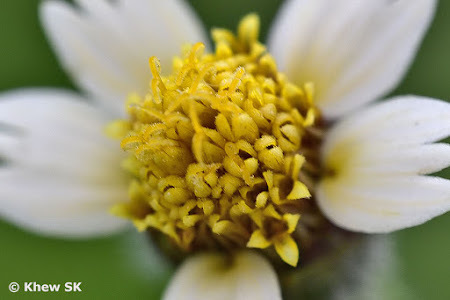 The centre of the flower bears disk florets that are dark yellow and hairy. 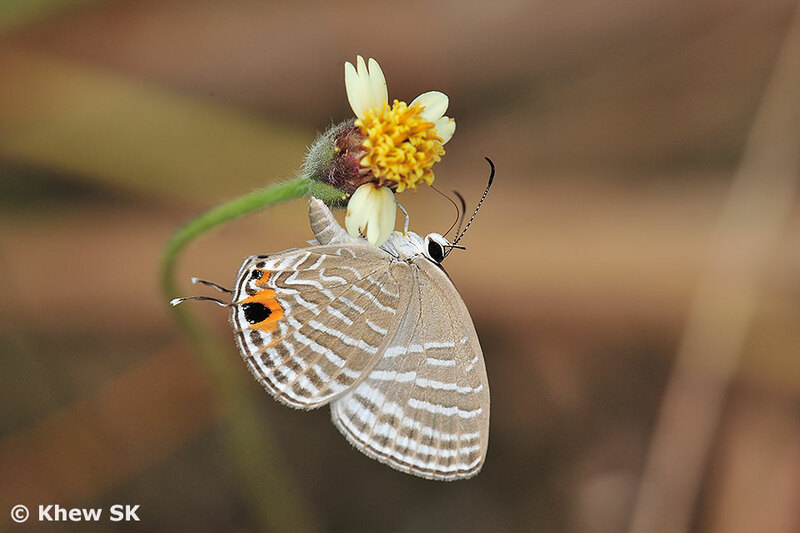 In Singapore, the Coat Buttons plant flowers all the year round with no dormant periods. Flowers are pollinated by butterflies, moths, stingless bees, small wasps and many other smaller insects. The fruits are dry, indehiscent and are known as achenes. 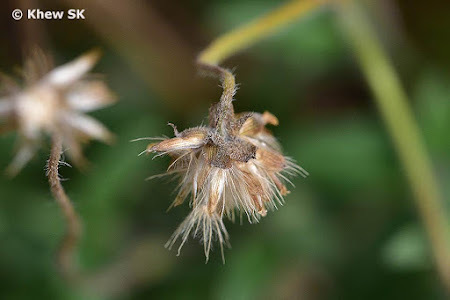 The brown to black, oblong fruits (2 mm long) are covered in silky hairs and have a 5-6 mm long pappus (a feathery appendage which helps the fruit to disperse by wind). 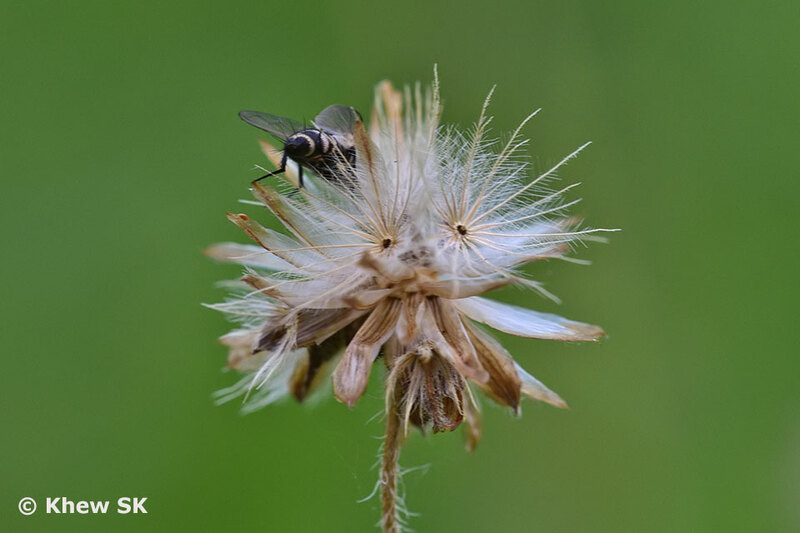 This plant is invasive in part because it produces so many of these achenes, up to 1500 per plant, and each achene can catch the wind in its pappus and be carried some distance. 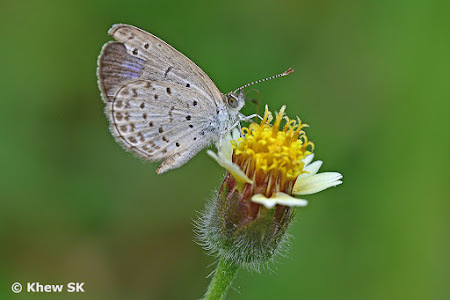 Over many years of observing butterflies, I have seen many species of butterflies feeding on the flowers of the Coat Buttons. 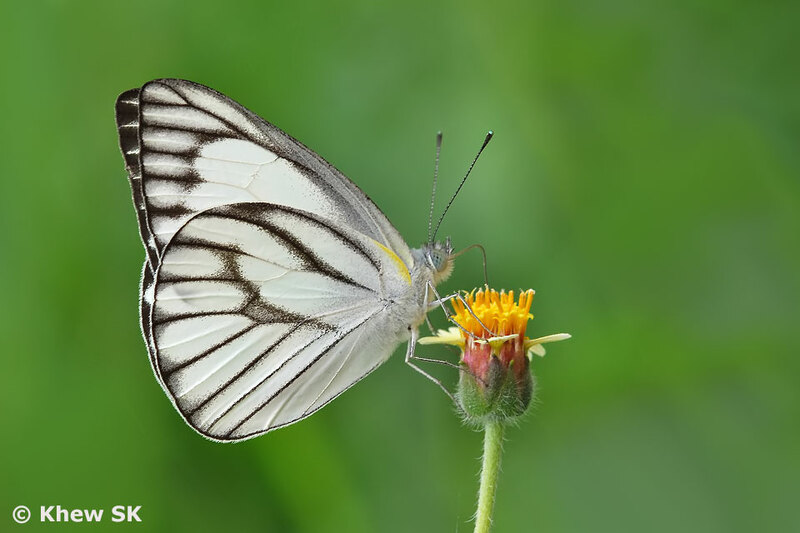 Generally, the Papilionidae (Birdwings and Swallowtails) do not prefer the Coat Buttons flowers whenever there are other nectaring sources available nearby. 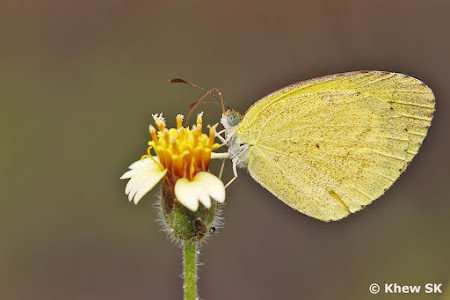 I have only seen a Common Mormon hover near the flowers but did not stop to feed on the Coat Button Flower. 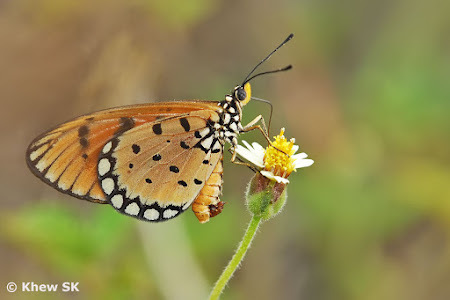 However, large butterflies from the Danainae subfamily, like the Common and Plain Tigers, have been observed to feed on the Coat Button flowers. 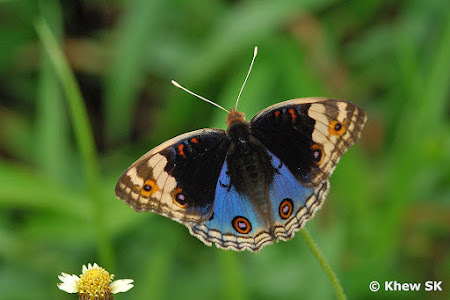 Amongst the other species of Nymphalidae family, I have seen the Blue Pansy in particular, feeding on the Coat Button flowers. It is also highly likely that the other Pansy species will also take to the Coat Button flowers. 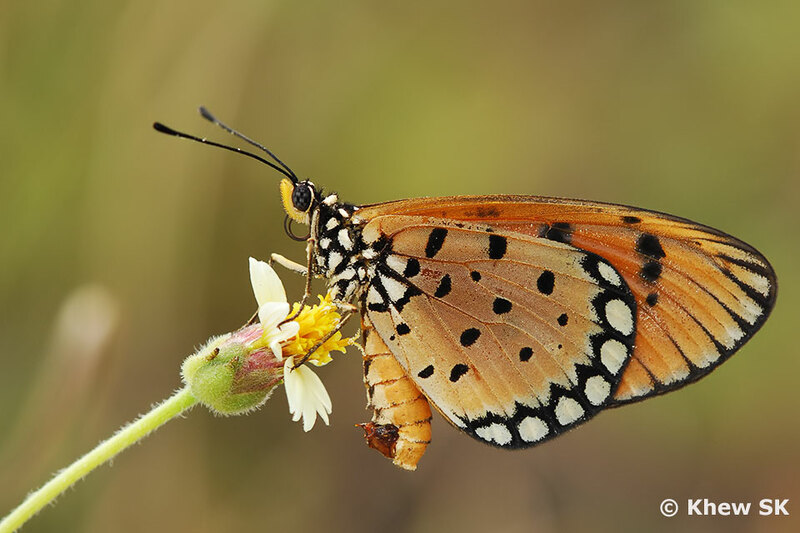 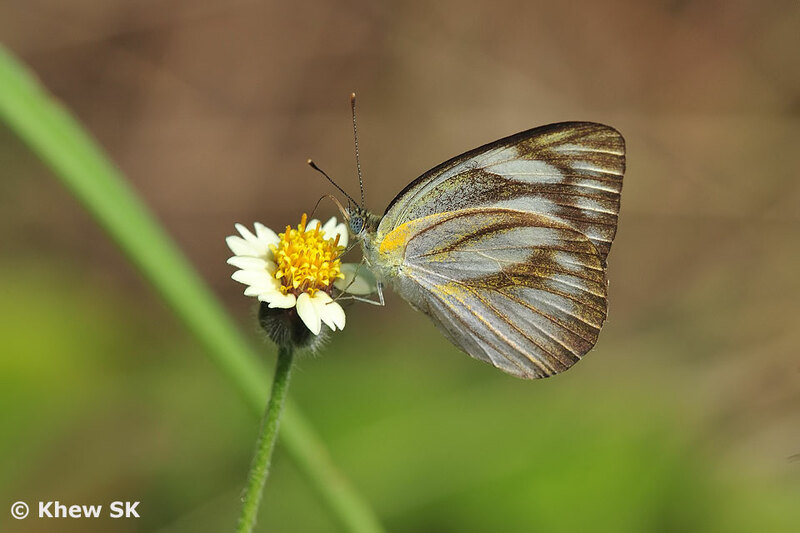 The Tawny Coster, a recent addition to the Singapore butterfly fauna about 11 years ago, also likes the flowers of the Coat Button. Some species of the Pieridae family also feed on the Coat Button flowers. Amongst those that I have had the opportunity to photograph are the Common Grass Yellow, No Brand Grass Yellow, Three Spot Grass Yellow and Striped Albatross. It is also possible that other species of the family will also feed on the Coat Button flowers. 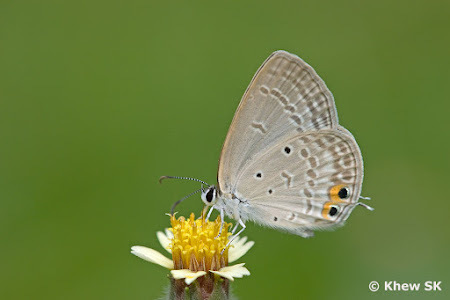 Amongst the Lycaenidae, particularly in the urban grass patches, I have regularly observed many Lesser Grass Blue and Pygmy Grass Blue fluttering amongst the flowers of the Coat Buttons. 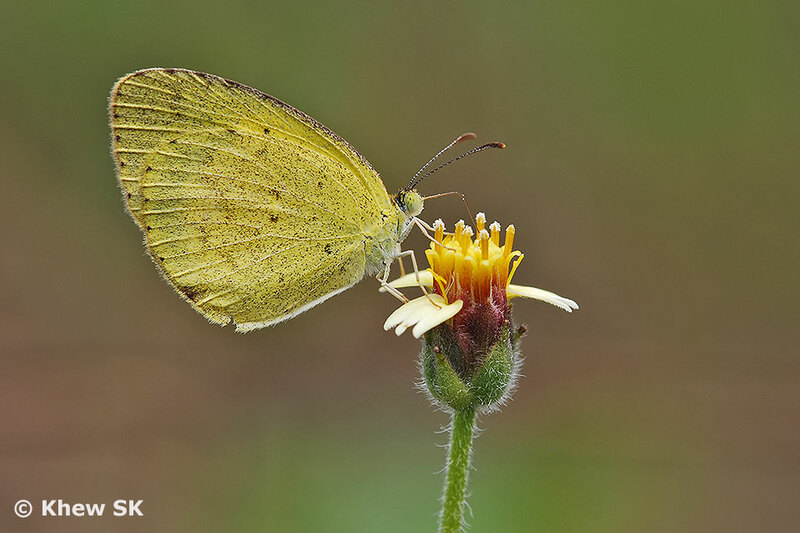 Even as the sun goes down, these small butterflies can still be active and flying amongst the flowers, sometimes stopping and resting on a Coat Button flower head to rest for the night. 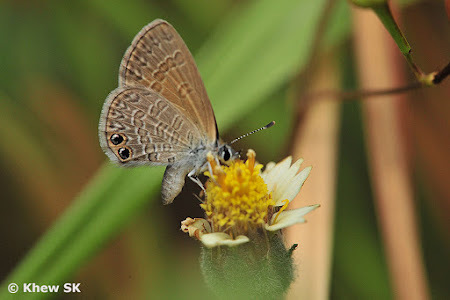 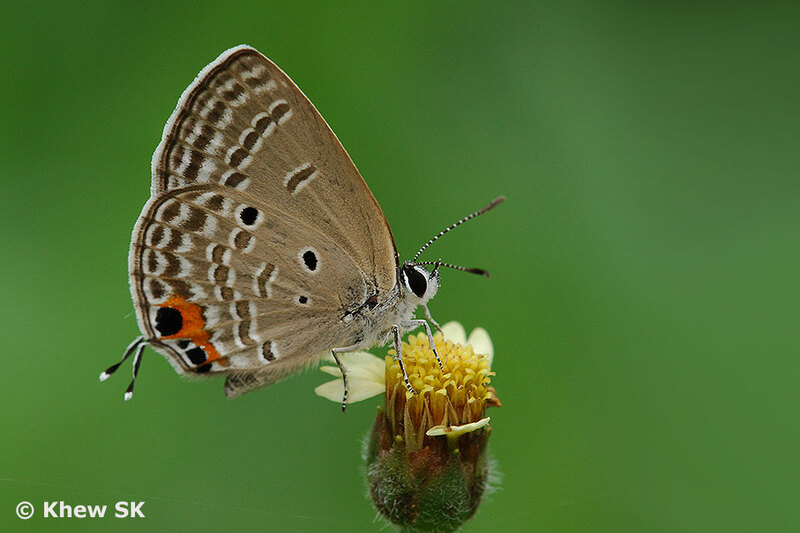 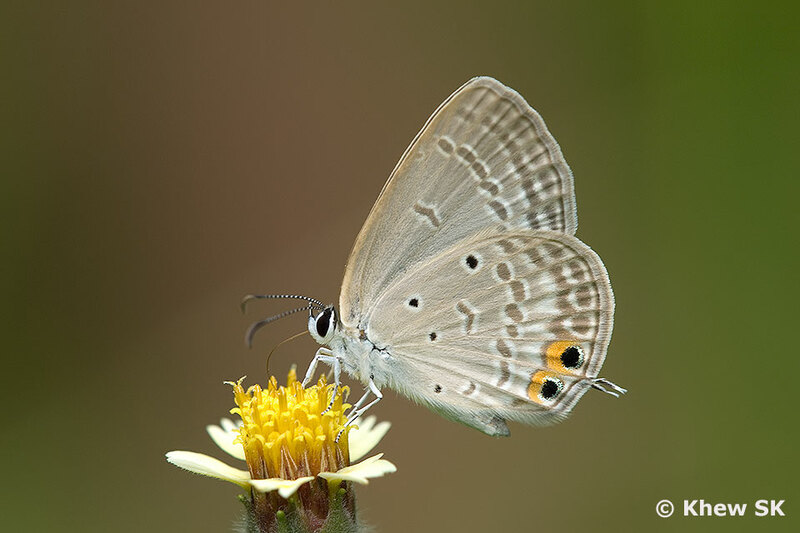 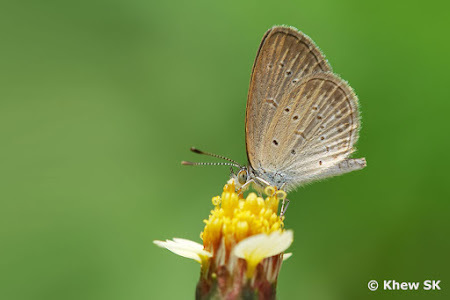 The remaining Grass Blue found in Singapore, the Pale Grass Blue, also feeds on the flower. Other Lycaenidae species like the Common Caerulean, Pea Blue, Cycad Blue, Two Spotted Line Blue and Gram Blue have also been seen feeding on the Coat Button flowers. 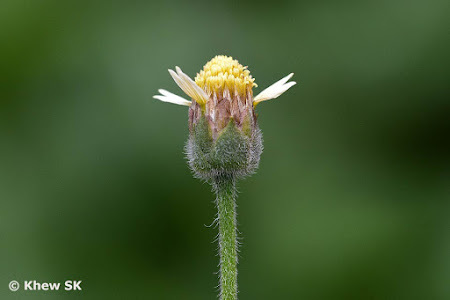 Other related species are also likely to feed on the flowers, especially those that are common in urban areas where the Coat Button plant grows profusely. 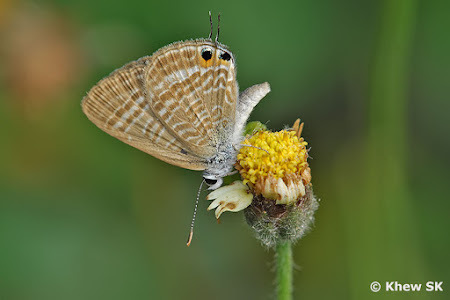 It is rather curious that I have not come across any of the skippers feeding on the Coat Button flower. Could it be perhaps skippers feed on the flowers in the earlier hours of the day? 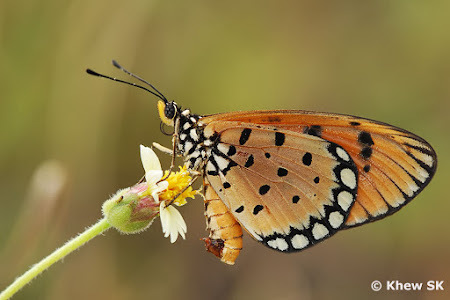 Or that they prefer to feed on other nectaring sources instead? If any readers out there have photographic evidence of any of the Hesperiidae species feeding on the Coat Button flowers, do share your observations. If you have come across other species that feed on the Coat Button flowers, please also share your findings in the comments below.